Tours will depart as scheduled except in rare instances such as equipment problems, severe weather or high seas. A little rain or too much sun do NOT stop the tour. Unfortunately, because of limited seating on the launch and because we must pay the full cost of a trip by the launch regardless of the number of tour participants, we cannot afford to have empty seats at the last minute. Please read the policy carefully and be sure you understand before you make reservations. If the Foundation cancels the tour for any reason, we will try to reschedule everyone. Anyone who cannot be rescheduled will not be charged. We will attempt to accommodate requests for tour date changes within the season if they are requested more than one week in advance of the originally scheduled date. However, if the new date is not available, or if individuals cancel their participation~ do not show up, miss the launch departure time, or choose not to make the trip due to weather (as in too hot, raining, etc.) or for any other reason, they will forfeit 100% of their payment unless we are able to resell their seats no later than one week prior to the tour date. If a participant is not allowed to board the launch because of improper shoes, because a waiver is missing or not acceptable, or because he/she is or appears to be intoxicated, that participant will forfeit 100% of the payment. Cold weather or light rain will not keep the trip from being made. However, high wind, rough seas, heavy rain or threat of severe weather can cause the trip to be cancelled. The Foundation or the launch captain may, in their judgment, decide to cancel a tour at any time, even after the launch is underway. This is for the safety of all. If a decision to cancel is made far enough in advance, that information will be provided to the answering service. If foul weather is in the forecast for your tour date, check with the answering service before you leave home. Volunteers will also attempt to reach each tour participant personally if telephone information has been supplied to us when tour reservations are made. Tour tickets are not refundable, but in the event of a weather cancellation, you will be offered the opportunity to reschedule for a later date. Again, in the event of questionable weather, please check with the DRBLHF answering service at 302-644-7046 or 302-448-0444. Please DO NOT call the Ferry Terminal. They will not have information. If a tour is conducted, "no shows" will be charged the full price of their tickets. Your safety is important to the DRBLHF at all times. To insure a safe and enjoyable tour, please review the following safety requirements. Please make a commitment to follow these instructions, heed the directions of tour guides and launch personnel at all times, and obey any posted warnings at the lighthouse. 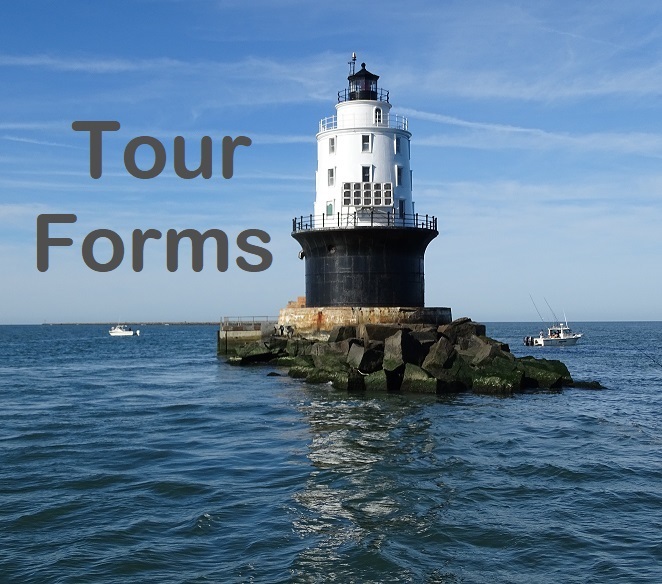 ·	Tour participants must sign the Tour Release Form below and mail it with the registration form. No one will be allowed on the tour who does submit this waiver. ·	Tour participants are not permitted on the open deck of the launch while it is en route to the lighthouse. All passengers must be seated inside the cabin during the trip, except for the photo stop just before disembarking at the lighthouse. ·	Tour participants are required to wear personal floatation devices (provided) as they board and disembark the launch as instructed. ·	Some areas of the lighthouse may be closed, please respect posted boundaries during your visit. The rocks of the breakwaters are off limits. Please stay on walkways. Also, please refrain from touching the lens. ·	The stairways and deck surfaces can be slippery when wet. Please watch your step for uneven floors and bulkheads that may be trip hazards and hold railings when possible. ·	You will be touring a site that is undergoing active work, climbing steep stairs, and boarding in a marine environment. It is important that you wear sneakers, boat shoes or other flat, sturdy foot ware with non-slip soles. Absolutely no high heels, flip-flops, sandals or other open-toe shoes. ·	Restroom facilities are extremely limited on the lighthouses and are reserved for emergencies only. Please remember this prior to boarding. ·	The sun can be harsh on the water. Protect yourself with a good sunscreen. ·	The weather is often cooler on the launch and at the lighthouses than it is on shore. It may also be windy. Consider bringing a windbreaker or a light sweater. ·	Greenhead flies and other insects can be a nuisance at certain times of the year. Consider applying a repellant before arriving or bring one along. ·	You are welcome to bring water and light snacks, etc. But please remember that everything carried to the lighthouses must be carried off. Please bring any trash you may have back to shore with you. ·	Nothing will spoil your outing faster than a queasy stomach. The boat trip is short, but if you are inclined to seasickness, remember to be prepared. ·	And by all means, don't forget your camera gear! The launch will position itself to allow participants to take photos of both lighthouses from the water while tour leaders prepare for your arrival at the light. Once on the lighthouse, you will find a wealth of things you will want to photograph. ·	Keep your camera and/or purse straps around your neck at all times on the launch and lighthouses. The Foundation cannot be responsible for personal items that are lost overboard.